Is the new Nikon D800 better than old favourite the D3x? Nikon's recent launches - the flagship D4 and scaled-down pro-level D800 - look set to revolutionise the future direction of the manufacturer's high-end DSLRs. Having stuck with its tried and trusted 12MP sensors for a number of years, with the D800 it seems that Nikon has relented and jumped headlong into the megapixel race at the top end of the camera market. Until now, the sole exception among the manufacturer's 12MP sensor-toting full-frame cameras was the Nikon D3x. Launched in 2008, this high-spec camera was designed to meet the demands of professional photographers who required the highest level of detail in their work, offering a full-frame 24MP sensor and a host of other technologies. The brand new Nikon D800 adopts a different form factor to the heftier D3x, omitting the built-in vertical grip and adopting a smaller profile akin to the old D700. But with the amount of new features packed into its smaller frame, it still looks like it will be perfectly capable of giving the older heavyweight top-end DSLR a run for its money. So, old or new: which is best? Read on for our in-depth comparison of these two top-notch contenders. The Nikon D3x certainly impressed reviewers and consumers alike at the time of its release, marking a departure from Nikon's reliable full-frame sensor that wowed us all when the D3 was introduced. Boasting a 24MP sensor, the D3x can still stand up to much of the modern competition in terms of the resolution it has to offer, but it is overshadowed by the D800's spanking new 36MP sensor - the highest resolution module we've seen from Nikon to date. This also has possible implications for main rival Canon. The new Canon EOS 5D Mark III sees the introduction of a 22.3Mp sensor, putting the Nikon D800 streets ahead of its major new rival. We sense an interesting head-to-head battle is in the offing. Back to the D3x: although we can't yet provide a full comparison between the real-world results produced by the older model and this newcomer, we can look at the favourable attributes of the D3x's performance and how relevant the sensor technology used in this camera is today. Looking at the trusty DXO Mark camera sensor ratings database, the fact that the Nikon D3x currently holds the third position in the ranking system is highly impressive. Add to that the fact that it's only beaten by two medium-format digital backs and the D3x's ability to hold its own against modern rivals becomes even clearer. Scoring highly for colour depth, dynamic range and low light performance, the D3x still has plenty to offer when it comes to image quality. Of course, this is subject to change once all of the recent high-end launches have been officially tested, but it does point to the fact that the D3x's sensor - although old by comparison - isn't yet outdated enough to dismiss when looking for a high-resolution DSLR. Both cameras sport clear and bright optical type fixed eye-level pentaprism viewfinders, offering 0.70x magnification. The Nikon D3x and the D800's viewfinders mutually provide 100% frame coverage in FX format, and each model offers -3 to +1m-1 dioptre adjustment, so there's nothing much to mark them apart in this respect. The only differences lie in the D800's incorporation of an updated Type B BriteView Clear Matte Mark VIII screen with AF area brackets and framing grid, in place of the D3x's Type B BriteView Clear Matte VI screen, plus the marginally altered eye point: 17mm (-1.0m-1; from centre surface of viewfinder eyepiece lens) for the D800 and 18mm (-1.0m-1) for the D3x. All-in-all, we'll call this one a tie. On paper, the Nikon D800's extended sensitivity range - which spans ISO 100-6400 by default and can be expanded to include 1EV below (ISO 50 equivalent) or 1-2EV above its top native setting (ISO 25600 equivalent) - offers more versatility for low-light shooters. By comparison, the Nikon D3x covers ISO 100-1600, expandable to include settings equivalent to ISO 50 and ISO 6400. In spite of its previously unprecedentedly high resolution full-frame sensor - bearing in mind that populating a sensor with too many pixels can often lead to poor low light performance - the D3x proved its worth by putting in a superb performance in reviews and real-world usage by consumers. Tests revealed that the now ageing model was among the leaders of the pack amid major rivals when it came to shooting at high ISO sensitivities, thanks to Nikon's on-chip and on-processor noise reduction systems. However, while the D3x is adept at handling noise in light of its densely-packed sensor, Nikon claims that the D800's sensor - despite its huge resolution hike - is capable of delivering a low-light performance comparable to the revered D700. While we're yet to have the opportunity to test this claim, we've no reason to doubt that Nikon has built upon its outstanding reputation for producing cameras that are, frankly, the masters of darkness. While both cameras' screens offer roughly the same high resolution (920,000-dots for the D3x and 921,000-dots for the D800) the newcomer is endowed with a slightly expanded LCD, measuring 3.2 inches, compared to the D3x's 3-inch offering. Otherwise, they're pretty evenly-matched. Constructed from low-temperature polysilicon, each camera's TFT LCD display provides roughly 100% frame coverage and a 170-degree wide viewing angle, plus brightness adjustment. Here, there's no competition at all: the Nikon D800 boasts Full HD movie recording capability, while the Nikon D3x offers no video option at all. It's worth noting, however, that each of these DSLRs has been designed with a specific end user in mind, so the attributes they have to offer are aimed at differing markets. Primarily intended for studio-based professionals - particularly those working with finely detailed subjects such as macro, portraiture and products - the Nikon D3x isn't your typical 'camera about town'. As such, the type of photographer that's likely to choose this camera over others is less liable to want/need video recording. But the Nikon D800, with its smaller form factor, is more easily portable and therefore ideally suited to situations where a professional might wish to shoot moving images in addition to stills: weddings, sport and social events, for instance, in addition to studio-based pursuits. In the absence of any comparison here, a brief summary of the D800's movie-making credentials includes the ability to record 1920 x 1080p, 30fps MOV-format files, using H.264/MPEG-4 Advanced Video Coding. As standard, the D800 records sound using its built-in monaural mic, although you can couple the camera with an external stereo microphone via a 3.5mm stereo mini-pin jack. HDMI output (using a Type C mini-pin HDMI connector) enables movies to be viewed directly from the camera on a compatible viewing device, while additional options including index marking and time-lapse photography broaden the D800's appeal in this aspect. Here we see the price to be paid for loading a camera with so much modern technology. The Nikon D3x manages to squeeze anything up to an incredible 4,400 shots out of its Lithium-Ion EN-EL4a rechargeable battery, whereas the D800's updated EN-EL15 (as used by the D7000) delivers a relatively meagre 900 shots per charge - according to CIPA standard testing. That's hardly surprising considering the amount of hardware crammed into the camera's comparatively compact body, but nonetheless perfectly adequate for most applications. Nikon also states that although the capacity of its newer battery is lower, power management is more efficient in the D800. You can improve performance further if you purchase the new optional extra vertical battery grip (MB-D12). This also boosts the D800's top continuous shooting rate to 6fps in DX mode (it's 4fps in FX format, regardless of whether you use the grip or not). Both cameras provide Nikon's familiar Picture Controls, which comprise a bank of image adjustments including options such as Vivid, Monochrome, Portrait and Landscape. Each camera also provides the facility to fine-tune each of these settings in terms of sharpness, hue and saturation, so you can ensure your JPEGs turn out looking precisely how you want them to, straight out of the camera. In the case of the Nikon D800, these parameters can also be applied to movies, plus the feature is more easily accessible, thanks to a new dedicated button in its revamped user interface. Both cameras benefit from Nikon's excellent Active D-Lighting feature. However, the D800 also provides a new in-camera HDR feature, offering an additional, simple method of expanding the dynamic range in your shots. The Nikon D800 and D3x equally are built to last, with solid magnesium alloy bodies that are weather sealed to guard against water and dust ingress. This is essential to ensure they can keep up with the demanding conditions that professional photographers so often have to work in. If we're being picky, the D3x does offer better weather sealing with its integrated vertical grip when comparing it to the D800 with its optional-extra grip attached. In terms of size and weight, the D3x's integrated grip does of course make it heavier and bulkier than the D800. As a studio-based camera, however, this isn't so much of a hindrance, and the built-in dual controls do make it faster and easier to work in both horizontal and vertical formats. But the D800 is more akin to the D700 in terms of looks and form factor. As such, it's equally well suited to a life on the road or in the studio, with the optional battery grip providing further flexibility. The controls on both cameras are intuitively laid out and well proportioned, making each one simple to pick up and start shooting with. 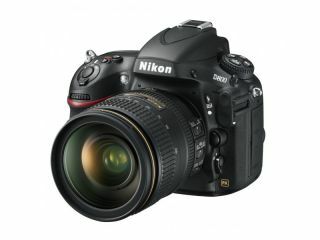 Having tried and tested many of the manufacturer's excellent DSLRs over the years, we'd expect nothing less from Nikon. Another draw here is that both cameras offer support for FX and DX (designed for APS-C format cameras) lenses, so you get to choose from the entire extensive Nikon range of optics. A quick search reveals that the D3x - although it's four years old this year - will still set you back anything between £3,300-6,000 in the UK, depending on whether you opt for a new or used model, and around $6,500-8,000 in the US. The shiny new D800, on the other hand, is being released with a full price of £2,399.99, or $2,99.95. It's still pricey, but when you factor in the newly-developed 36MP full-frame sensor, HD movie recording capability and its incorporation of Nikon's latest and greatest technological developments, it starts to look like the better option in terms of value for money. That said, the D3x is a highly impressive camera that's proved its mettle in the years that have passed since its creation, and it continues to be the camera of choice for many discerning professional photographers. As far as we're concerned, unless our tests reveal any major flaws with the D800's brand new sensor (which is highly unlikely), choosing between the D3x and the D800 is a bit of a no-brainer, particularly given the price difference between the pair. Yes the D3x was - and still is - an outstanding camera, capable of producing incredibly high quality images. But in light of Nikon's recent technological developments, we think it's probably had its day. We're expecting the manufacturer to develop an official replacement for the D3x in the not-too-distant future. But for now, if having the highest resolution sensor and the latest technology at your fingertips are your top priorities, then the D800 should definitely be on your radar.